The different types of water heaters include storage tank and on-demand tankless options. A storage water heater provides a tank of hot water that is ready to go when you need it. Tankless options heat the water on demand when you turn on the hot water faucet. High-efficiency heat pump water heaters (sometimes called hybrid water heaters) are now available for Minnesota’s climate, as well. Heat pump water heaters are powered by electricity, but they work by moving heat from the air surrounding the unit into the water inside rather than having an element to heat the water directly. They are more expensive to purchase but use significantly less energy and may cost less overall once the annual operating cost is factored in. Not all contractors are familiar with heat pump water heaters, so you may need to ask around a little if your technician isn’t comfortable with the technology. Consider the number of people you have living in the house and how often you use appliances that use hot water simultaneously. A storage water heater with a tank that is too small may run out of hot water. If your tank is too big, you will be wasting energy to heat water you do not need. Similarly, the flow rate of a tankless water heaters will need to keep up with your demand, but you won’t want to buy a model that’s much more powerful than you need. The number of people living in your household may influence the type of water heater that works best as well. Because a storage tank water heater holds hot water at the ready, the hot water will be available for different applications at once. A tankless water heater may have trouble keeping up in situations where there are multiple applications using hot water. For example, if a shower and a dishwasher are running at the same time. The upfront cost of the water heater is not the only thing to look at when purchasing. It is important to also consider the cost of running the system. While tankless water heaters are typically more expensive than storage tank water heaters, the annual operating costs will be much lower. Less expensive water heaters tend to be less energy efficient, which will mean higher energy costs to run it throughout the lifecycle of the unit. The cost of the fuel that powers your water heater will also factor into operating costs. Local utilities often offer rebates for high-efficiency water heaters, which can help bring down your initial costs. 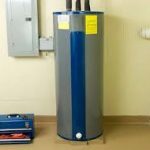 Many electric utilities in Minnesota offer water heater-specific rates that may make standard electric storage water heaters cost competitive to natural gas options. Be sure to check with your utility to see if such a rate is available for you. In Minnesota, water heaters most commonly run on electricity, natural gas, or propane, but they can also be powered by fuel oil, solar energy, and geothermal energy. Depending on where you live, there may only be a few of those fuel options available. 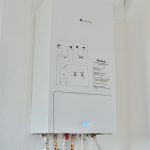 While natural gas is inexpensive right now, natural gas powered water heaters may not be the most cost-effective option when factoring in the efficiency of the unit. For example, high-efficiency heat pump water heaters run on electricity which is typically more expensive. But, because they are so efficient, they will cost less to run annually. 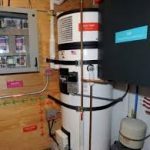 The U.S. Department of Energy water heating guide provides an overview of each type of water heater and information that will help you make the best decision for your household, including a guide to determine what size water heater you need and a calculator to figure out the annual and lifetime energy costs of models you’re considering. And, as always, if you have other questions please reach out to us at CUB, and we can help point you in the right direction.